WIER, BENJAMIN, entrepreneur and politician; b. 9 Aug. 1805 in. Newport Township, Hants County, N.S., the son of Benjamin and Phebe Wier; d. 14 April 1868 at Ottawa, Ont. The Wier family migrated to Nova Scotia in the early 1760s as part of a band of Ulstermen brought out by the land speculator, Colonel Alexander McNutt*. Succeeding generations provided Anglican vestrymen, justices of the peace, and members of the provincial assembly. When Benjamin Wier’s father died about 1827, however, his family was forced to auction off his property in order to satisfy his creditors. By this time young Benjamin had married a cousin, Phoebe Wier, and had gone into business as a country storekeeper a few miles outside Windsor. Attracted by Halifax’s commercial bustle in the prosperity of the late 1820s, Wier moved to the capital in 1830 and attempted to establish himself as a member of the Water St commercial gentry. His expectations suffered a severe blow, however, when Halifax’s commercial boom collapsed in the mid 1830s. Deprived of his waterfront property by relentless creditors and reduced from the status of merchant to that of retail grocer, Wier nevertheless remained in Halifax. When trade revived in 1838 he formed a partnership with John Bowles Woodworth and moved back to the waterfront to conduct a modest wholesale-retail trade in everything from herring to shingles. The partnership collapsed, however, amidst a new trade recession in 1841, and Woodworth’s subsequent bankruptcy placed Wier’s credit in jeopardy. During these difficult years Benjamin Wier acquired the reputation of being an unmannered malcontent. In 1836, for example, he received a 10s. fine for assault and a £10 fine for selling liquor without a licence. Wier also became known as a political agitator. His name appeared on various petitions drawn up by Halifax shopkeepers demanding reform of the municipal administration and its allegedly discriminatory tax structure. In the mid 1830s, when warfare between the Halifax Banking Company and its new rival, the Bank of Nova Scotia, disrupted credit and spawned numerous business failures, Wier attended protest meetings and signed petitions which denounced Halifax’s moneyed élite as being dangerously irresponsible. By the end of the 1830s he had become identified with the campaign against oligarchy led by Joseph Howe*. Like many other small property owners in Halifax, Wier saw reform as a means of achieving municipal incorporation under a democratic charter which would enable them to oust the traditional merchants from their position of dominance in civic affairs. Confronted with Howe’s relative moderation on the issue of municipal reform, Wier did not see his ambitions fulfilled until the latter half of the 1840s when he helped democratize the 1841 city charter through a lowering of the property qualifications for councillors and electors. In 1851, after brief service in the new city council which gave him the reputation of being a Liberal partisan and advocate of the spoils system, Wier secured election to the provincial assembly for Halifax Township. By this time Wier had finally established himself as a successful businessman. About 1845 he moved into the wholesale trade and began specializing in commerce with New England, shipping out fish in exchange for American foodstuffs, tobacco, tar, and other staple commodities. In 1847 he put two small sailing vessels on a regular packet run between Halifax and Boston. The service proved profitable and was continued until 1860 when steam replaced sail. During the 1850s Wier acquired a fleet of schooners which traded throughout the Gulf of St Lawrence, supplying the outports from Halifax and bringing back fish, oil, and timber for trans-shipment to New England. As business expanded, Wier began taking in partners: Reuben Ingriam Hart in 1850, followed by his son-in-law John Thomas Wylde, Levi Hart, and Charles James Wylde. Benjamin Wier and Company’s premises on Lower Water St were valued at £12,000 in 1851, a considerable improvement over the £200 credited to Wier by municipal assessors in 1834. Wier had also purchased in 1849 a £1,400 residence amongst the Hollis St urban gentry. Before long the joint-stock companies spawned by mid Victorian prosperity had made these neighbours Wier’s business associates. 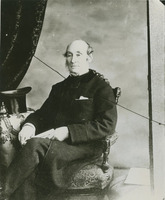 By 1860 he sat on the board of directors of such varied enterprises as the Halifax Marine Railway, the Grand Lake Land Company, the Chebucto Marine Insurance Company, the Union Marine Insurance Company, the Union Bank of Halifax, and the Acadian Iron and Steel Company, firms whose capital investment totalled around $2,800,000. As a mark of honour Wier was asked to assume stewardship responsibilities, such as serving on the directorate of the Halifax Visiting Dispensary. Wier’s new respectability was further secured when he joined the masons, the Oddfellows, and the Halifax Yacht Club. In 1852 he was initiated into the Charitable Irish Society, the most influential lay organization within the local Irish community, and four years later became its president. Wier’s rise in society had a profound impact on his political views. Although his early assembly speeches argued for manhood suffrage and the ballot, by the mid 1850s his business, social, and political career had changed his attitude. He abandoned the pursuit of extended democracy and eventually began attacking those who dared question the institutional status quo. By now his political principles had been reduced to a few basic convictions: the construction of railways through state enterprise, free trade with the United States, retention of liberal liquor laws in the face of temperance agitation, and, above all, retention of power by the Liberal party. Although “without education except what he has picked up for himself,” Wier constituted a powerful presence on the floor of the legislature. A tall, large-framed man, with “a great massive face . . . and a harsh expression of countenance which he improves the wrong way by scowling,” Wier possessed the energy and adroitness needed to bluster his way successfully through debate. Personifying the new breed of shrewdly ambitious businessmen-politicians emerging in mid Victorian society, Wier did not go unnoticed. In 1856 he was appointed to the Executive Council by Premier William Young*. The promotion came at a time when the Liberal party had begun to disintegrate as Irish Roman Catholics and Protestants divided over the issues of separate schools and volunteer enlistments for Britain’s Crimean War. 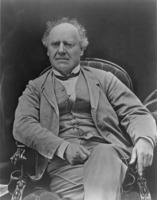 Despite the prestige he enjoyed as president of the Charitable Irish Society, Wier proved unable to reconcile the opposing factions, and the Young government fell early in 1857 [see Joseph Howe]. Wier’s only accomplishment while in power had been allegedly to promote implementation of the spoils system within the provincial civil service. During the late 1850s Wier and Charles Tupper*, the Conservative leader, became bitter political foes, and their exchanges in the assembly frequently deteriorated into vicious name-calling. This rivalry was at full strength after the Liberals returned to power in the early 1860s. The new government found itself caught up in the frenzy of a Nova Scotian gold-rush, and although Premier Howe personally avoided the temptations of illicit profit, some of his colleagues proved less virtuous. Financial Secretary William Annand* and Benjamin Wier became the focal point of a major controversy in 1862–63 when Tupper discovered they had used privileged information available to them as cabinet members to speculate in gold mine property and also try to sell worthless real estate to unsuspecting British investors. Both men survived an inquiry by the lieutenant governor, but the scandal contributed to the government’s and Wier’s personal political downfall in the 1863 provincial election. Loss of his seat proved to be of little consequence to Wier’s personal well-being, since his business interests were expanding. In addition to large blocks of real estate in the province’s gold fields, he acquired another $50,000 worth of Halifax waterfront property and some new corporate stock; he became a director of several additional enterprises such as the Nova Scotia Electric Telegraph Company, the Nova Scotia Permanent Benefit Building Society and Savings Fund, the Acadian Fire Insurance Company, the People’s Bank of Halifax, the North Sydney Marine Railway Company, and the Sea Bay Coal Mining Company. A number of new social distinctions came his way, including a seat on the Halifax Chamber of Commerce and the commodoreship of the Halifax Yacht Squadron. His philanthropic donations increased, and he took an active interest in an Anglican chapel in the city where the poor could worship without paying pew rent. Wier’s most famous, or infamous, business venture in this period consisted of acting as Halifax agent for many of the Confederate blockade runners active during the Civil War. Profit rather than patriotism probably motivated this activity. In return for ship repair facilities in Halifax, the Confederates could supply him with valuable cotton for re-export to Britain, a lucrative but hazardous course for Wier which required severing his business connections with New England. By late 1864, faced with the imminent collapse of the Confederacy, Wier found himself in an awkward position. Although he ultimately did re-establish trade with the north and become agent for a steamer service linking Halifax with the Grand Trunk terminus at Portland, Maine, he remained persona non grata in the eyes of the American government and could not get a visa to visit American territory. Therefore, despite his dislike of Tupper, Wier embraced the cause of British North American union as a solution to his own difficulties as well as to the problems of Nova Scotia when faced by a hostile United States. Furthermore, at meetings held to debate the union issue, Wier forcefully Argued that construction of a Halifax to Quebec railway, something he had urged 20 years earlier, would give Nova Scotia a new future as a base for manufacturing. In other words, Wier had already perceived the dry rot of technological obsolescence in Nova Scotia’s “Golden Age.” Although he could not persuade many of his Halifax business colleagues to commit themselves to an urban-industrial future, his efforts obtained for him the reward of a seat in the Canadian Senate in 1867. Wier’s death in Ottawa early in 1868 abruptly ended his career just as it reached its peak. The anti-confederate Morning Chronicle admitted that the province had lost its “most enterprizing” merchant. The truth of this assertion was demonstrated by Wier’s estate inventory which listed assets in excess of $200,000. Obituaries suggest Wier had inspired not affection but grudging admiration, and the dozens of Haligonians who turned out for his funeral did so in commemoration of one whose career had embodied a successful application of the contemporary gospel of self-help. Halifax County Court of Probate (Halifax), no.1544, will of Benjamin Wier (mfm. at PANS). National Archives (Washington), RG 59, U.S.A., Dept. of State, Dispatches of U.S. consuls in Halifax, N.S., 1860–65 (mfm. at PANS). PANS, MG 20, nos.68–69, 1850–83; RG 1, 291, no.157; 312, no.3; 313, no.115; 414, no.97; 451; RG 5, GP, 2, 1856; P, 122–23; RG 35, A, 3, Halifax assessments, 1833–41; Vertical mss file, Benjamin Wier papers. St James Anglican Church (Newport and Walton, N.S. ), register of baptisms (mfm. at PANS). Halifax Ragged and Industrial Schools, Annual report, 1864. N.S., General Assembly, Statutes, 1845–68; House of Assembly, Debates and proc., 1855–63; Journal and proc., 1838, app.44. Acadian Recorder, 23 Feb., 15 March, 31 May 1856. British Colonist (Halifax), 19 Aug. 1851; 4 Dec. 1858; December 1862; January 1863; 16, 21 April 1868. Evening Express (Halifax), 15 April 1868. Halifax Carnival Echo, midsummer 1889. Halifax Journal, 31 March 1834, 1 Jan. 1838, 1 March 1841. Halifax Morning Post, 2 March 1841, 10 Feb. 1842. Halifax Reporter, 14 April 1868. Morning Chronicle (Halifax), December 1862, January 1863, 15 April 1868. Novascotian, 1830–68. Presbyterian Witness, 18 April 1868. Sun (Halifax), 28 Jan. 1847, 25 Feb. 1848, 6 May 1852, 1 Jan. 1856. Times (Halifax), 14 Nov. 1843. Belcher’s farmer’s almanack, 1830–68. Canadian directory of parl. (Johnson). Directory of N.S. MLAs. Halifax, N.S., business directory, for 1863 . . . , comp. Luke Hutchinson (Halifax, 1863). McAlpine’s Nova Scotia directory, for 1868–69, containing directories of each place in the province . . . (Halifax, ).Nova Scotia registry of shipping: with standard rules for construction and classification, comp. T. R. DeWolf (Halifax,1866). F. W. Thirkell, The first two hundred years; the story of the parish of Newport and Walton ([Newport, N. S., 1959?]). David A. Sutherland, “WIER, BENJAMIN,” in Dictionary of Canadian Biography, vol. 9, University of Toronto/Université Laval, 2003–, accessed April 26, 2019, http://www.biographi.ca/en/bio/wier_benjamin_9E.html.